Today’s cars are a bit of a time-warp, taking us back to the late 1980s, an era where drivers at the end of the Cold War were warming up with some very hot cars. 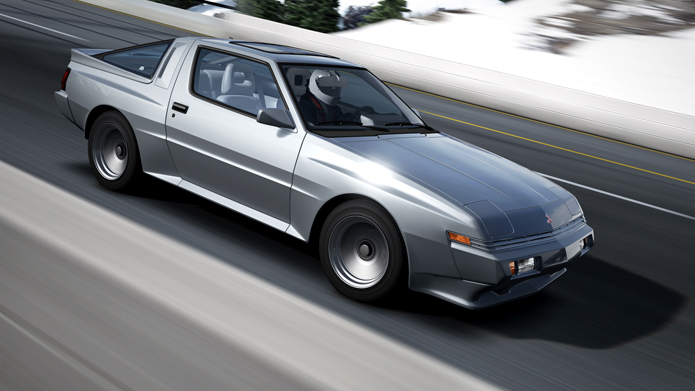 One of my favorites is a new car to Forza 4: the Mitsubishi Starion ESI-R, the surprisingly versatile sport coupe that found success on pavement and in the dirt. From the same era, but very different places, come the Lotus Carlton and the Lamborghini Countach LP5000 QV. They’re both mental, but for very different reasons. Mitsubishi was certainly ambitious in naming their range-topping sportscar after a celestial object; “Starion” is officially a contraction of the phrase “Star of Orion.” The ambition was justified, as the Starion sports the latest state-of-the-art (for the time) Japanese sport-coupe technology. Introduced in 1982, this 1988 Mitsubishi Starion ESI-R is the final evolution of the breed—and the last rear-wheel drive turbocharged Mitsubishi to date. The box flares and aero kit separate the ’88 from earlier models, taking the space-age 1980s styling to its zenith. Boasting a huge 2.6-liter “Astron” engine, with such performance features as hemispherical combustion chambers and an intercooled turbocharger, the Starion has a full 188 horsepower at its disposal. That’s enough to give any of its contemporaries a run for their money, and with four-wheel independent suspension it can handle too. It’s probably not surprising, then, that the Starion had a very successful racing career as a production racer and, in modified 4WD form, won the grueling Paris-Dakar rally’s experimental class back in 1983. Considering that it’s a powerful, rear-wheel drive Japanese car, it’s also not surprising that the Starion is very active today among drifting and modification crowds. From an automaker best known for their elfin racers and commitment to lightness, the large Carlton seems a bizarre vehicle to emerge wearing a Lotus badge. An executive sedan tweaked within an inch of its life, Lotus’ engineering expertise allowed the Lotus Carlton to be the fastest sedan in the world for a period of time. Born at a time when General Motors owned both Lotus and Vauxhall/Opel, the idea was to build a halo car wearing the Lotus badge to generate some attention. By boring out and then twin-turbocharging the Vauxhall inline six, the 377 horsepower Carlton got a bit too much attention—the 180 mph-capable sedan became so wildly controversial in Britain that law enforcement sometimes spoke of banning it from the road. Perhaps the police were simply jealous, as no cruiser in the UK could catch a Carlton on a clear motorway. In an era where traction control devices weren’t even a glimmer in a safety-conscious engineer’s eye, there are no nannies to turn off, meaning the Carlton can engage in smile-inducing tail slides on command. And lest you think that it’s merely an unruly straight-line ruffian, Lotus did also tune the suspension; it’s no Elise, but you’d be surprised what the big Carlton is capable of. If any single car could summarize the entire decade of the 1980s, it’s perhaps the Lamborghini Countach. The name Countach comes from the amazed exclamation of styling studio owner Nuccio Bertone on getting a look at the original concept his designer Marcello Gandini had come up with (“countach” is similar to “wow!” in a dialect of Italian), but imagine what he would have said upon catching a glimpse of the much more extreme LP5000 QV. Low, massively wide, and covered in scoops, strakes, and wings, this Countach certainly looks like the most extreme variant of the ultimate 1980s car around. And it’s no poseur, either, as anyone who’s heard the growl of the 5.2-liter V12 can attest to. The “QV” in the name comes from quattrovalvole, referring to the new 4-valve-per-cylinder head that increased power to 455 horsepower, an incredible output for the late ‘80s. So while performance was understandably phenomenal, it’s also the best of the breed. If a test drive doesn’t convince you, perhaps the opinion of long-time Lamborghini official test driver Valentino Balboni will: he considers it to be the ultimate Countach, with the perfect amount of brute force to match the stunning lines of the original hypercar. 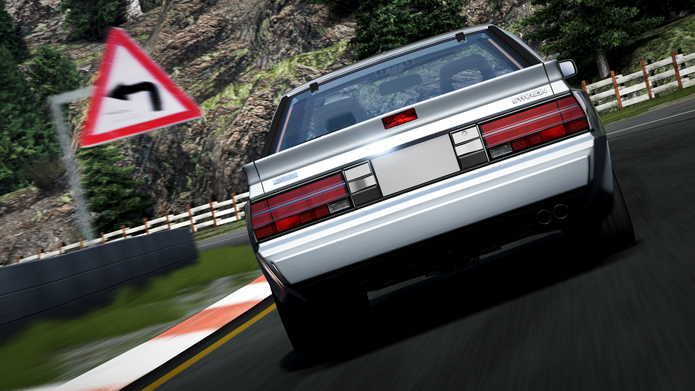 Thankfully, you don’t have to have been around in the 1980s to appreciate these cars, because all you have to do is wait a bit longer for the rapidly approaching release of Forza Motorsport 4 in October to have a chance to drive the Starion for yourself. If you’d like, hop over to our thread on the forums and let us know what you’re most excited about using the Starion for. That’s a wrap for today. Remember to check back each weekday for more Forza Garage car reveals.